Ha! See what I did there? Instead of my posting about bread again and you all rolling your eyes and saying, “Sheesh, doesn’t she have any other hobbies?” I teased you – taunted you – got you to ask about bread! My powers know no bounds!!! This is called Pain d’Epi, or “Wheat Stalk Bread”, or – as I like to call it – “Every single piece has a buttload of delicious crust!! !” It’s basically the same recipe as the regular bread from Artisan Bread in Five Minutes a Day, but you either use bread flour or a little more all-purpose. Mix it up, let it rise, keep it in the fridge. 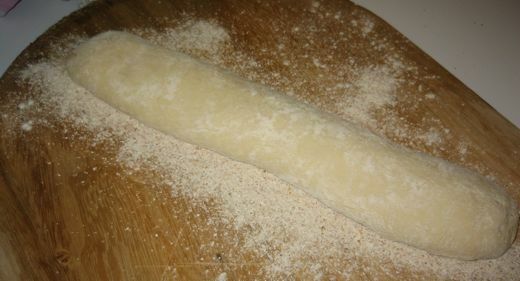 When you want some, cut off a hunk, gently shape it into a log and put on a whole-wheat (or cornmeal)-floured pizza peel. Let it sit for 30 minutes, then dust it with flour and cut it with scissors (not all the way through) at a 45-degree angle and flip each piece to the side. Slide it in the oven (pre-heated 450) and add a cup of water to the pan inside, and bake for 25 minutes. Break off a crusty chunk and devour. The kind and amount of flour determines how nicely your ‘wheat grains’ turn out. My dough was a little soft, so they look more like rounded blobs than pointed wheat grains, but I don’t care. Crust. Crust is the whole reason for this obsession. Again, the genius of this method is you can take as much or as little dough as you want. I’ve learned that I can’t be making these 7-roll-long logs, or I eat the whole thing. Buy the book! Hehe… I giggle every time I read the French word for bread: “Pain”. Lauren made a recipe called “Pain”… hehe. Darn you Brad…I thought I was up early enough to be first post. And, you stole my sentiments too. Altho, I do believe this is the bread that healed me during the week! And yes, I agree, mmmmmm .. crust! That bread looks absolutely Frenchtional! I must try it at once. But I’ve been having trouble with the outside getting done but middle being too doughy … any trouble shooting ideas about that. Yeah, I have the same problems with the big loaves. They have some suggestions: Don’t cut it until it’s all the way cooled. (Are they nuts?) Check your oven temp with a thermometer. Make sure your dough rests long enough before baking (big loaves should rest longer and bake 10-15 minutes longer). Make dough a little drier. Looks great! I haven’t tried this version, not having a baking stone. But maybe I’ll try a small one in the dutch oven. 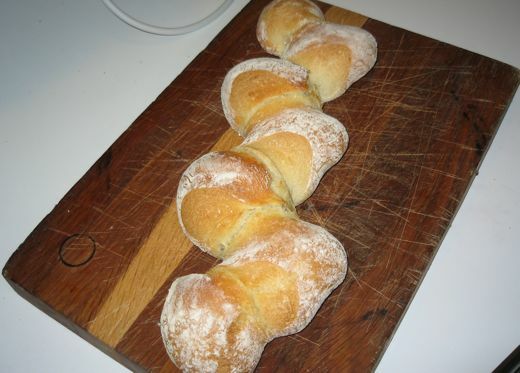 I think fresh, homemade bread is a treat anytime. I regularly bake bastches of six biscuits for my wife and myself. I will definitely try your pain d’epi recipe. Thank you for sharing! Made pain d’epi (how do you pronounce it -- I am fracturing it I know) and it was so beautiful and delicious and I made it with freshly made dough because I could not wait to see if it turned out. Next time I will make less because like you my husband and I almost ate the whole 8 piece loaf. Also I bought a oven themometer and mine was off 50% degrees so I put the oven temp to 475 and it is perfecto. Sorry about my last post my oven was off 50 deg not 50%. Whew -- I was going to be impressed with an oven that went up to 950*!